A mountain Temple, filled with maple leaves in Autumn, provides a great view of the valley of Kiyotaki river. Jingo-ji Temple was established in 824, located on the hillside of Mt. Takao in the northwest of Kyoto city. The Temple is usually visited along with Kozan-ji and Saimyo-ji Temple which are both very nearby. But Jingo-ji is the most visited one among Mt. Takao’s temples. It’s also known as the temple where famous priest Kukai (774-835) lived and worked for 14 years after returning home from China. A long set of stone steps, leads up to a large entrance gate and multipule temple buildings. Jingo-ji has a number of National Treasures including ancient calligraphy written by the priest Kukai as well as several important Buddhist statues. The Main Hall, “Kondo” was rebuilt in 1934. It enshrines Yakushi Nyorai, the Buddha of Healing and Medicine. 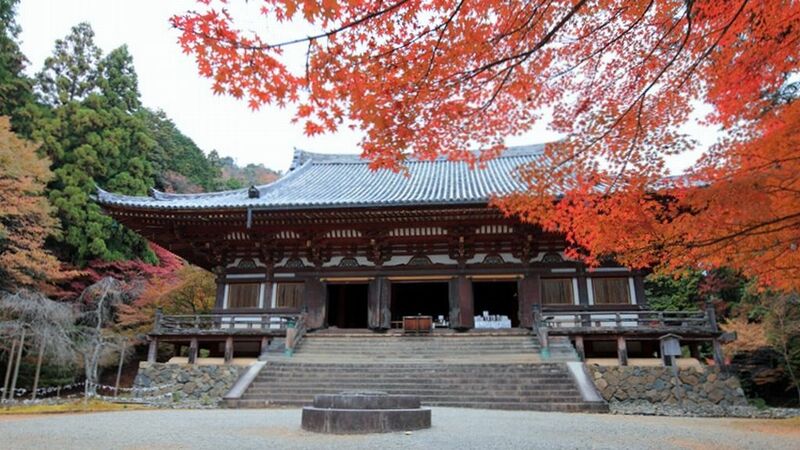 Jingo-ji Temple is one of the best spots for autumn leaves in Japan. The landscape from an observation point with views over the valley of the Kiyotaki-gawa river in autumn colors is astonished. Visitors can try a play called “Kawarake-nage”, by throwing small clay discs into the valley for evil away, which is performed also as the practice of exorcism. Access : Take the Kyoto city bus No.8 from Shijo or Karasuma station to Yamashiro-Takao. It is a 20-minute walk from there. The spectacular autumn colors around the temples in this forested valley north of Kyoto, Takao area. Jingo-ji Temple is the most renowned autumn leaves spot and offers evening illuminations.